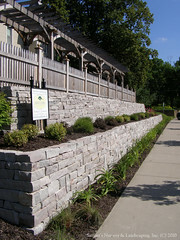 Landscaper Landscaping Landscapes… Repetitive and redundant, just a bit… but Hey, you found us! 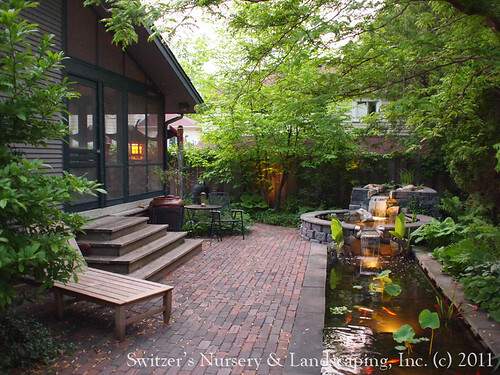 Welcome to Switzer’s Nursery & Landscaping, Inc. We are an Award Winning Full Service Landscape Design/Build company with a passion to create emotionally evocative environments for your life. 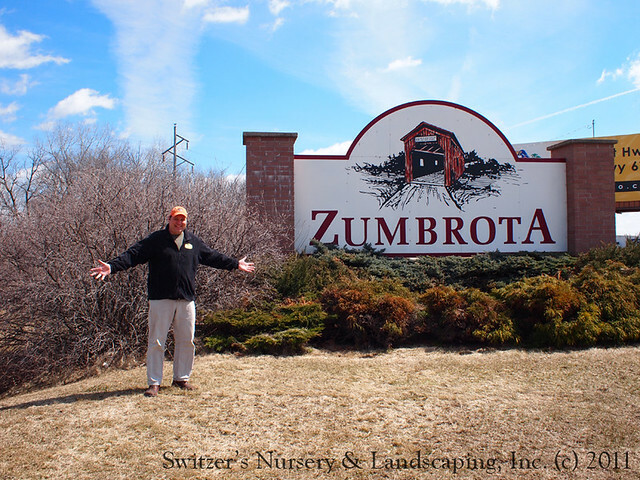 Switzer’s is located just eight miles north of Northfield on MN State Highway 3. We have been there since 1926. While we love the World Wide Web, the internet can provide some challenges… like how do you find us when you get a million results in .23 seconds? With that in mind we’ve created these blog postings to help the search engines. 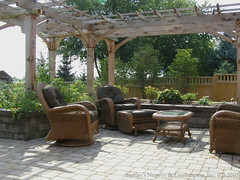 We service anyone that shares the passion for creating works of ART to live in. But, our primary area is the Twin Cities, the South-Metro and South-Eastern Minnesota. We will be adding cities to the list below as we go along. If you don’t see your city yet don’t worry we’ll be there shortly. You can send us an email if you’re not sure and we would love to work with you! 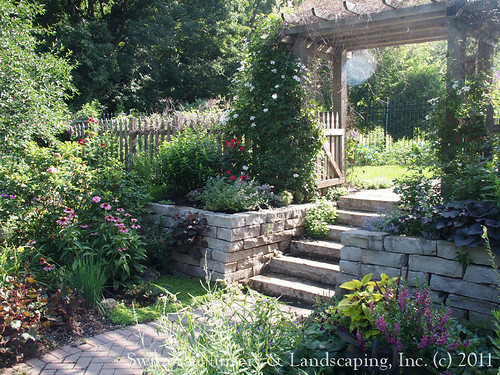 Landscaper Landscaping Landscapes… in a city near you! 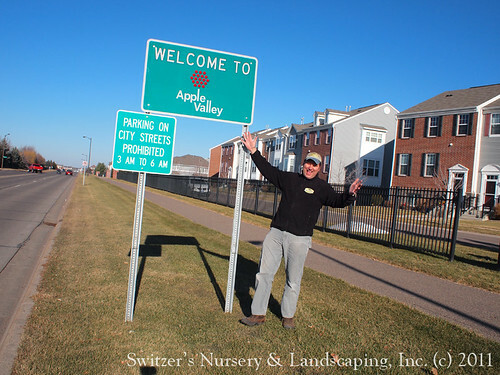 but, YES, we landscape in Apple Valley. 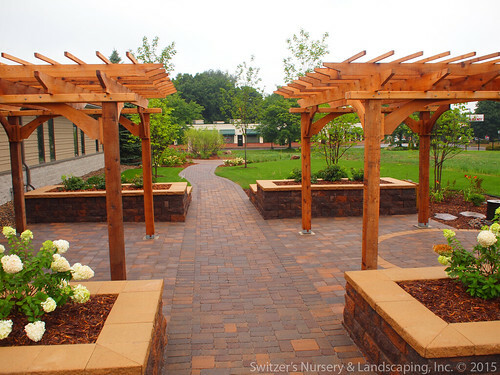 The ART of Landscape design is truly apparent in every Landscape Structure crafted by Switzer’s. Each is uniquely designed and then hand crafted from the finest materials. 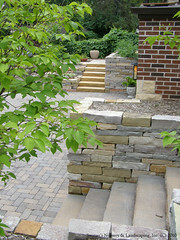 Precision installation will give you years of worry free outdoor enjoyment! 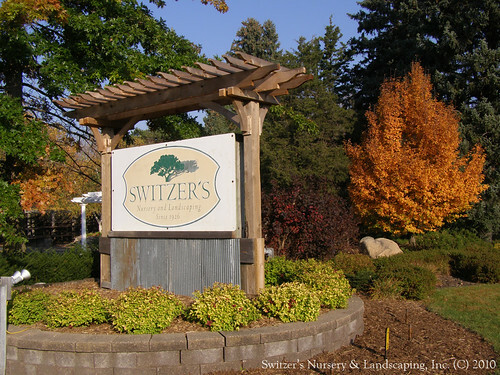 All of the pergolas and arbors in the following video have been designed and installed by the team at Switzer’s… also, visit the Landscape Structures on the portfolio page. 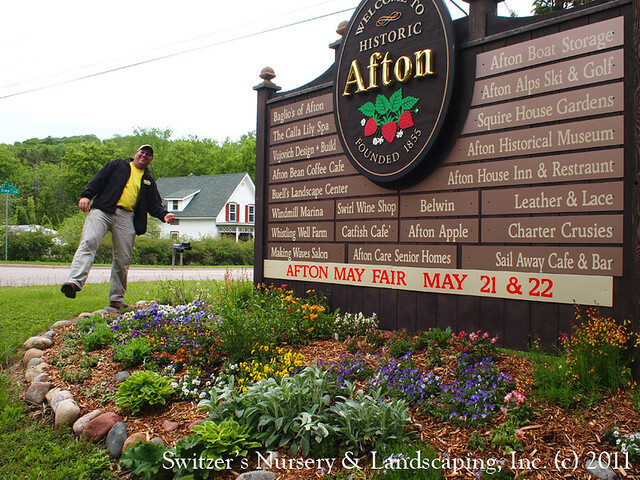 but, YES, we landscape in Afton. …just better. 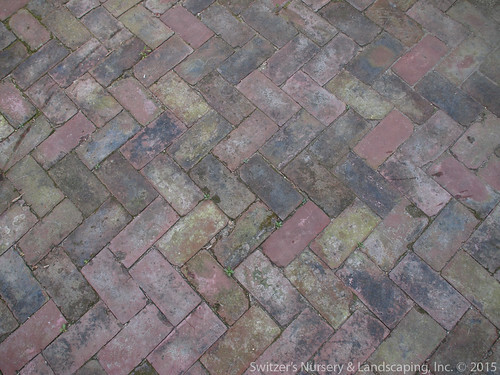 It may seem a little pretentious, but Borgert’s statement about their paving stones is spot on. 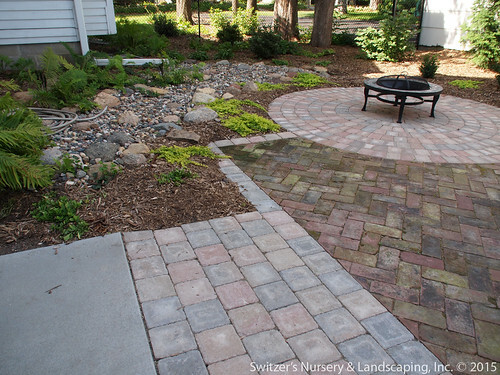 From the granite aggregates to the rich colors, the unmatched strength to endless pattern possibilities Borgert’s paving stones perform! Visit their website to find out a little bit more… Borgert Products. 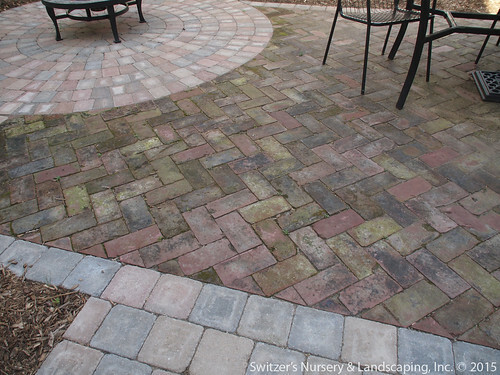 Please enjoy the following photos of interlocking concrete paver patios, walkways and driveways designed and installed by Switzer’s Nursery & Landscaping. We are members of the Interlocking Concrete Pavement Institute. 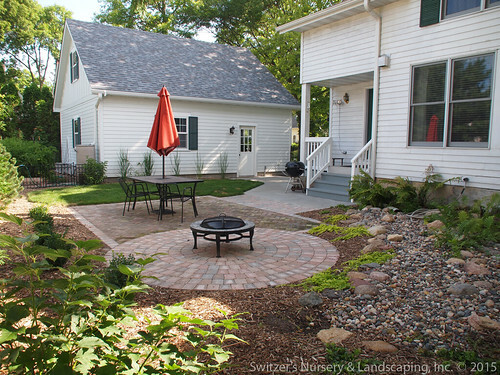 but, YES, we landscape in Northfield. 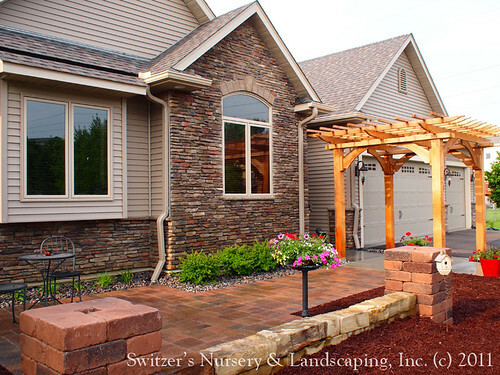 Switzer’s Nursery & Landscaping is located just eight miles north of Northfield on MN State Highway 3. We have been there since 1926. 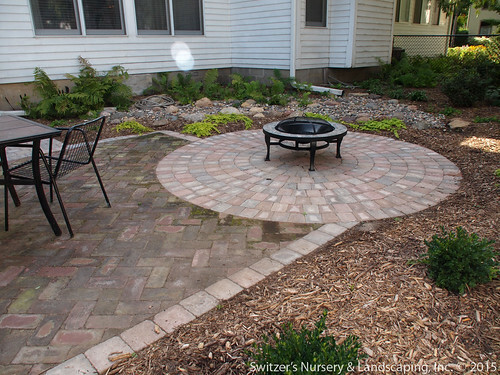 Switzer’s is a Full Service Design/Build Landscape company specializing in creating and/or enhancing your outdoor living space. 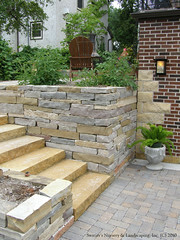 Please view the Portfolio Page to enjoy images of projects we have designed & installed. Thank you for your time. 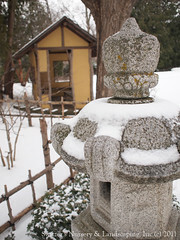 one ~ PATTERNS & SHAPES ~ The white snow and gray skies can provide for some dramatic contrasts. The skeletal structure of shrubs and trees are on full display. Many have interesting bark or a funky branching structure. The Burr Oak being one of our favorite. 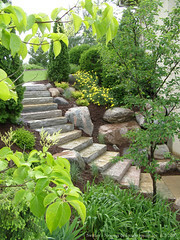 Broad leaf evergreens like rhododendron or boxwood can provide a delicate interest while larger evergreens can decorate the grander landscape. 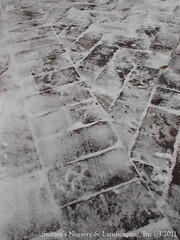 Pavers, boulders, natural stone and other hardscaping elements should be considered for their winter possibilities. 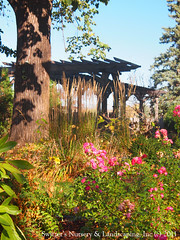 two ~ COLOR ~ While it may not be the explosive color of a massed perennial garden, winter color can be just as dramatic. 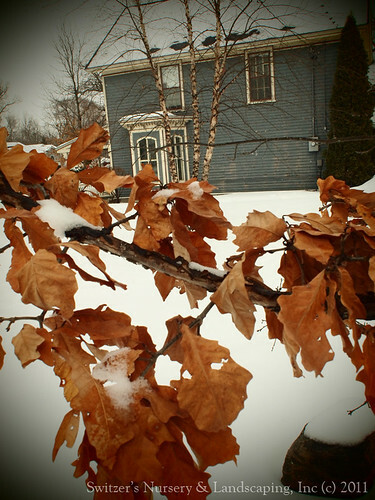 Several plants have amazing color that stands out in the winter. Especially the dogwood family. The bronze colored bark of the Scotch Pine truly is inspirational during the winter. Evergreens have different colored needles and can vary in shape. 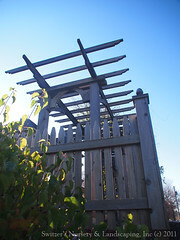 Garden accessories painted in bright colors can also play a starring role during the winter months. three ~ ACTIVATION ~ Whether it is a gentle breeze rustling the remaining leaves on an oak tree or the wind whistling through the needles of a white pine the movement can be most engaging. Flower heads left on hydrangea and the inflorescences of ornamental grasses activate the garden close at hand. Wind chimes are not only a pleasure for the ears but also the eyes with their rhythmic movement. 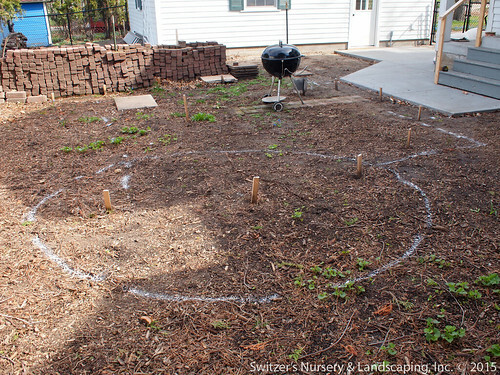 Inviting the wildlife to participate in the garden can be enjoyable at the bird feeder, but a bit more challenging with deer and rabbits. 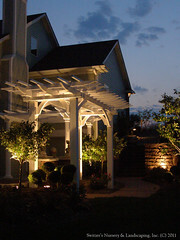 four ~ STRUCTURE ~ Pergolas and arbors provide wonderful interest in the winter by framing views and by casting the delicate long shadows of winter. Not everyday is sub-zero so providing a shelter to escape from some of the elements can elongate your time outside. Many structures are just wonderful to look at when they’re covered with a layer of fresh snow. five ~ THE VIEW ~ The view is something that is always important in landscape design, but planning for the winter months is a must. First inside looking out… the placing of landscape elements so they can be viewed form the window is most important. 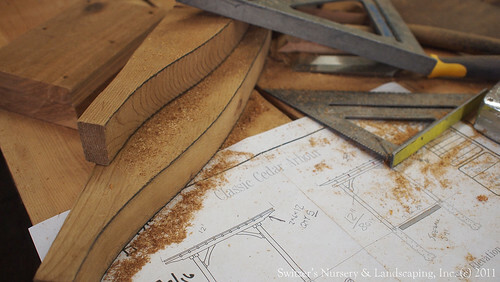 Not only the bird feeders, but all key elements should be kept in mind when designing. 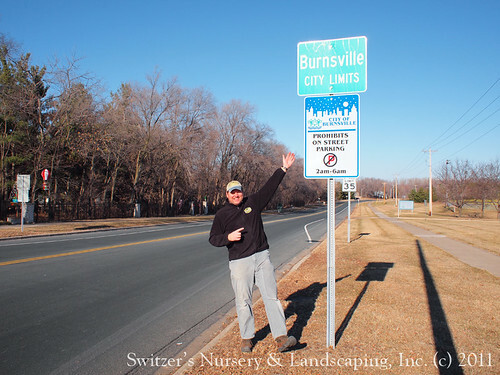 Keeping track of the flow of traffic outdoors, especially pedestrian, during the winter assists in the placement of landscape elements. 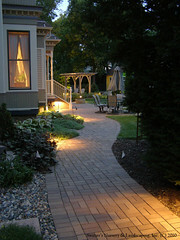 One element that helps all of the ideas above is Low Voltage Landscape Lighting. Especially in the winter when the duration of daylight is short the lighting can really brighten up the landscape. 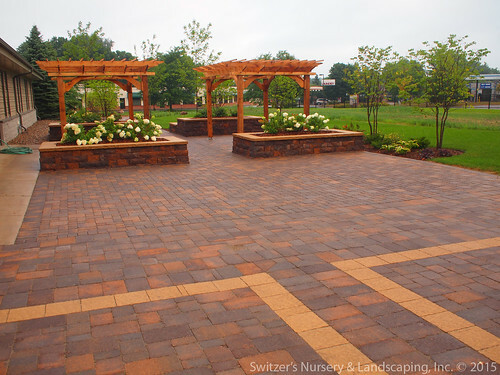 Patterns & Shapes, Color, Activation, Structure and The View are some of the principles used by the landscape designers at Switzer’s Nursery and Landscaping to provide it’s clients enjoyment in their landscaping the whole year. 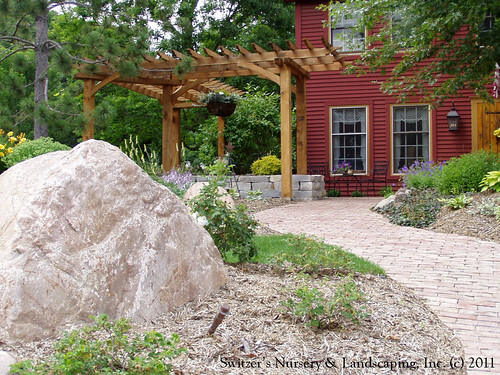 In Redoux Home’s currant issue, March/April 2011, landscape designer Glenn Switzer shares his thoughts on a recently completed project in Northfield. Check out the article…. page 19 and make sure to click full screen for easy reading, enjoy! 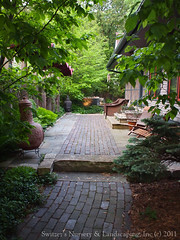 Redoux Home is delightful home and garden lifestyle magazine originated in Northfield, Minnesota. 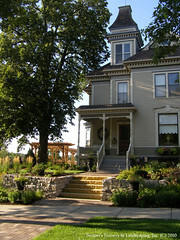 They describe it best on their website’s about us page, “REDOUX HOME is a local publication rooted in Minnesota. We strive to inspire and inform our readers while promoting a sense of community. We highlight local businesses, homeowners and artisans and provide our readers with useful information and tips to simplify their lives and beautify their homes. We promote a green philosophy and environmentally conscious stories and ideas. 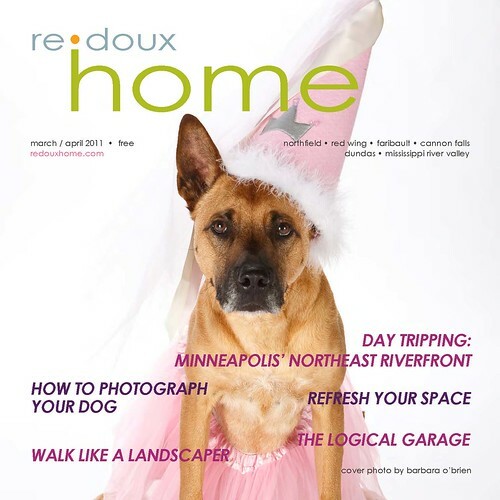 We publish two bi-monthly editions: REDOUX HOME SOUTH and REDOUX HOME TWIN CITIES.” You can also find Redoux Home on FaceBook – they have all kinds of fun little tips and suggestions for your home and yard… like them and you’ll LIKE them..